In my last post, in which I gushed over the Swords & Wizardry Legion Pack (SWLP), I nitpicked about the scale of the map provided on the back of the folder that comes with the pack. I still maintain that 50 miles per hex is WAY too big, especially if this packet is intended for use as an introduction to FRPGs. Now, as an experienced Referee, I might want to erase all the villages and towns and then focus in on one 50 mile hex to make it my own, but such an exercise makes the map provided rather useless. It depicts part of the map provided with the SWLP. According to the scale of this map the distance between Darnagal and Potter's Field is about 50 miles. According to the map provided with SWLP, the distance between these two towns/villages is around 6 hexes or 300 miles. That translates into travel times of just less than a week on the older map to a travel time of over a month on the SWLP map. To put this in context, I looked up my old stomping ground on Google Maps and planned a trip from the Boston Convention Center in downtown Boston to Fenway Park. This morning, the fastest route was 7.7 miles. If we did to Boston what Frog God Games has done to their world, that distance would now be 46.2 miles. A trip of about 17 minutes is ballooned to a trip of over an hour. At that distance, the Boston Red Sox really aren't in Boston anymore. I have no issue with Frog God Games trying to make their world much bigger than what it has been is the past, but not only does it make the map provided in the SWLP useless, it also radically changes the material previously provided by Necromancer Games and Frog God Games. If I ever wanted to run Shades of Gray, for example, I would either have to ditch the map from the SWLP or re-write significant portions of the adventure to fit the new scale. Or, as I mentioned in my previous post, I can just drop the '0' from the '50' and use the map as it was originally designed. I got a very special surprise in the mail today. Michael Badolato was kind enough to send me the Swords & Wizardry Legion packet and it is Awesome! This thing is gorgeous and it makes me wish I were 9 years old again so that this could have been my first introduction to roleplaying. It is simple, elegant and just gorgeous to look at. You get two cards for each character class that has everything you need to know on them. It has two copies of S&W Light. It even has a small pad of graph paper. 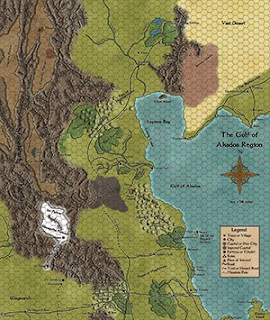 As a big fan of cartography, my favorite part is the map of The Gulf of Akados Region from Frog God Games' Lost Lands on the back of the folder. My Gamer ADD is in overdrive. This little packet is a goldmine of inspiration. Kudos to everyone involved! I do, however, have one small complaint. Again, as a big fan of cartography, I take huge issue with the scale of the map of The Gulf of Akados Region. It declares that each hex is 50 miles! My first Lost Colonies campaign, which lasted about 3 years, took place largely in one 50 mile hex. This scale is grossly out of proportion. To give some sense of context, the Gulf of Akados, which takes up about a third of the map, is larger than the Mediterranean Sea. Almost half again bigger. There are several Ruins on this map, giving potential Referees all kinds of opportunity to create dungeons and adventures of their own. Unfortunately, due to the scale of the map most of these ruins are between 150-200 miles away from the nearest town or village noted on the map. 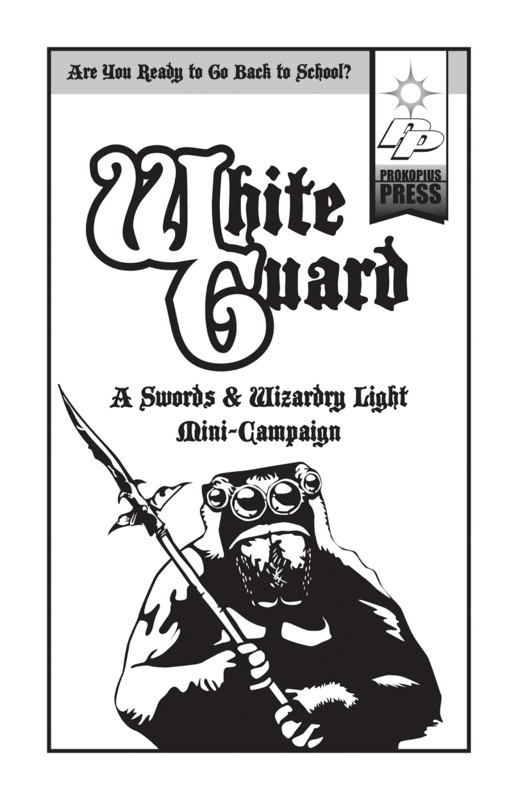 Swords & Wizardry movement rules state that a character can hike their base move in miles per day. Given the average burden of a typical 1st level character, that base move is most likely going to be 9. At nine miles per day, a party of adventurers would have to travel between 17 and 23 days in order to get to the ruins marked on this map. In other words, as is, the map is useless. Fortunately, it is rather easy to erase that ‘0’ after the ‘5’ and reduce the travel time to 2 days and the size of the Gulf of Akados to about half the size of Lake Superior. Other than that “typo” this is an incredibly cool little package. Recently, my eldest has shown interest in running an RPG game. 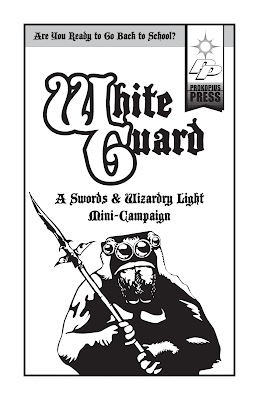 Therefore, I pulled out Erik Tenkar's Swords & Wizardry Light and handed it over because at 4 pages it is a brilliant way to allow a new Referee the ability to get a real handle on all of the rules. After this, we decided on a campaign concept and we put together the following document together. She has successfully run two sessions so far and it has been a lot of fun. Therefore we thought we would share. The file can be found here. Please note, this really hasn't been edited so if you happen to find anything that needs to be fixed I would greatly appreciate if you let me know in the comments. Thanks. The concept follows the Magic School trope of fantasy literature and allows for PCs to go to magic school and graduate once they get past 3rd level. Talysman over at The Nine and Thirty Kingdoms has been meditating on random maps. His most recent post posited a leximorphic method that quite intrigued me. So, in a fit of Gamer ADD, I grabbed my favorite set of RPG random tables, The Tome of Adventure Design, and set about trying Talysman's method. There would be a number large halls in the dungeon. 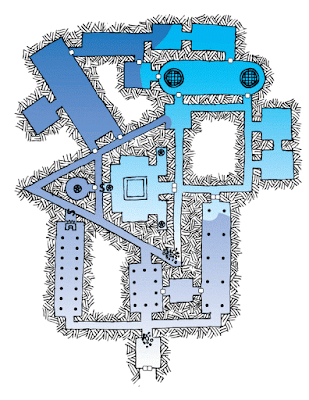 The dungeon would be partially submerged under water. The letters that suggested themselves for the leximorphic approach were A, P and E.
The 'A' area is highly finished with tile ceilings, floors and walls. Its main feature is The Screaming Temple. The 'P' area is rough hewn from rock. Its main feature is The Bizarre Ice Gateway. The 'E' area is precisely excavated with smooth walls, floors and ceilings. Its main feature is The Lesser Throne of the Golem, which has already been looted of its valuables. The dark blue indicates an area submerged in water. The darker the color, the deeper the water. The light blue areas indicate ice. The darker the color, the thinner the ice. The Lesser Throne of the Golem is located in the left-most columned hall. The Screaming Temple is the odd-shaped room with the square dais and statues. The Bizarre Ice Gateway is the double doors in the right-most columned hall.